Wouldn’t it be nice if someone would give us the guidelines to skip the hard stuff and get right to the GREAT story ending? Why does it take so long to get there? This isn’t that list. Apologies to my readers who were hoping for otherwise. That’s because conflict and dissatisfaction and challenges are an integral part of the STORY. You might not like those elements, but they’re what set action and outcome in motion. Without them, we have no story, or one that’s both unrelatable and unbelievable. I can’t guarantee you success or your readily-available happy ending. But I can help you Take Command of Your Story by eliminating some of the roadblocks to success. Consider them Commandments from Commander-in-She. Appropriately, there are 10. And while none should require further explanation, should you desire a deeper dive into any corresponding commandment, simply click on the link for more. I could add more… (like Thou Shall Have a Hard Time Selecting Just 10, and Thou Shall Proofread and Thou Shall Not Worry About Low Follower Social Media Count), but I’ll save those for another round. On this day, I Command you, my readers, to Take Command of Your Story by following your own Commandments. What might they include? 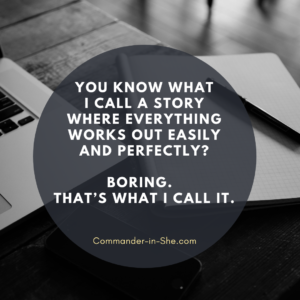 Comment away or email info@commander-in-she.com with your story. I want to hear from you! Valerie Gordon is an Emmy award-winning television producer and the founder of communication strategy firm Commander-in-She. She helps audiences find the power in their stories – past, present and future – for greater success and satisfaction at work. Find out what clients are saying here.